Not everyone has a 3D printer but that doesn’t mean you can’t join in the fun. Many places have printers you can use for a fee or places you can send your designs to be printed. The trick is, you have to design something in 3D. 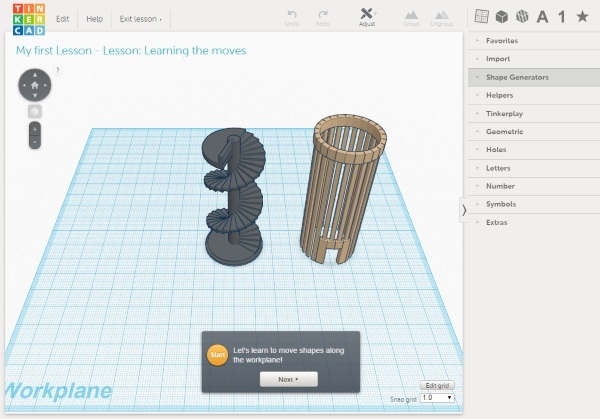 Tinkercad is the easy design tool for quick and fun creation. There are a lot of 3D modeling programs out there with CAD being the most well-known. However, it takes some serious study and practice to really learn how to use it well. Practice that not everyone has the time and desire to put in. Enter Tinkercad. Manipulate basic shapes to design and build your own 3D models. As soon as you sign up, you can dive right into an easy to follow tutorial that will show you around the program. The entire thing is web based so work from anywhere. It allows you to save in a number of file formats for both printing and laser cutting. If you’re looking for an easy way to get into 3D design or have an idea you want to work out, head over to the website and start playing around!